This funky and fun purple shading brush illuminates the eyes in seconds. Use it around the eye area to blend and shape. The soft fluffy bristles make it easy to apply your shadows smoothly every time. 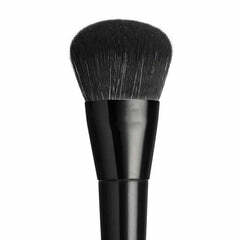 Its bristles are made with high-quality vegan materials, offering a cruelty-free way to enjoy this professional makeup tool. 16.8cm full length. Bristles - 1cm high, and 1cm wide.